Do you want to visit Machu Picchu but do not want to spend a lot? You must know that the Wonder of the World is one of the most economical destinations in the world. To travel cheaply, you must do it on your own, arrive by the hydroelectric route and, above all, buy the entry ticket Machu Picchu via the internet. Know the complete guide to go to Machu Picchu cheap! What is the price of the trip to Machu Picchu? What is the price of the Machu Picchu entrance? What is the price of the entrance Machu Picchu 2018? How to pay less when buying the entrance to Machu Picchu? How to get to Machu Picchu economically? How to go to Machu Picchu by Hydroelectric? What is the price of the bus ticket to Machu Picchu? How to get on foot from Aguas Calientes to Machu Picchu? What is the price of hotels and restaurants in Machu Picchu? What is the price of the trip to Machu Picchu in total? The price of the trip to Machu Picchu depends on the type of service that the visitor wishes to experience in the Wonder of the World. Train tickets to Machu Picchu .. The price of the entrance Machu Picchu depends on the type of ticket as well as the age and nationality of the visitor..
By booking on the official website of the Ministry of Culture of Peru, visitors can get official prices. However, through the official website you can not buy tickets Machu Picchu at a discount for university students and minors. The tours to Machu Picchu include the entrance. However, to get the best prices you must purchase the ticket directly online.. Check the official prices of the tickets Machu Picchu 2018. The entrance to Machu Picchu Only has a cost of 152 soles (47 dollars). To access the best prices of the Machu Picchu entrance, you must reserve the entrance with a discount. Discount for university students: Undergraduate students and under 25s access a special discount by making their reservation with the university student card. Discount for minors: Children (between 8 and 17 years old) access a special discount by making a reservation with their passport or identity document proving their age. Discount for citizens of the Andean Community: The citizens of Peru, Colombia, Ecuador and Bolivia have access to a special discount making their reservation with a passport or identity document that certifies their nationality. There are 3 ways to get to Machu Picchu. The most adventurous (and expensive) is with the Inca Trail. The most usual and direct way is with a train trip to the town of Aguas Calientes. The most economical way is with the alternative route by Hydroelectric. Peru Rail’s ‘Expedition’ train service costs approximately $ 140. The ‘Hiram Bingham’ luxury train, $ 950. The cheapest way to get to Machu Picchu is through the Hidroeléctica route. The last section before reaching the Wonder of the World is the trip from Aguas Calientes to Machu Picchu. This tour can be done by bus or on foot. Because the road is steep, some visitors prefer to get on the bus and get off on foot. Climbing on foot from Aguas Calientes to Machu Picchu is free. Just follow the Hiram Bingham road and take some well-marked shortcuts along the way. The duration of the trip is 2 hours on average. The return is in the same way although less difficult. The obligatory expenses for a regular trip to Machu Picchu are: tickets, train tickets and bus tickets. Another necessary expense in the Wonder of the World is to hire the services of a tour guide. Guided service is mandatory in Machu Picchu. Among the other important expenses are the hotel and restaurant services. Tourist guides – The cost of tourist guides depends on the number of tourists in a group. If a bilingual and specialized guide is reserved online for a private group, you can pay up to 50 S /. (US $ 15) per person. Hotels – The 5 star hotels in Machu Picchu cost more than a thousand dollars a night. However, for an average trip, this service can cost 100 soles (US $ 30) a night in the town of Aguas Calientes. Tourism guide – At the entrance gate to Machu Picchu there are tourist guides offering their services. The cost varies according to the number of people in a group. Currently, a maximum of 15 tourists per group is allowed. The cost is 15 S /. (5 U $ D) per person. Hotels – There are lodgings in Aguas Calientes that cost 40 S /. (13 U $ D) the night. However, the cheapest way to spend the night in Aguas Calientes before visiting Machu Picchu is to camp in the Machu Picchu municipal camp. The cost per tent is 15 soles (US $ 5). The field includes shared bathrooms, tables and chairs in a conditioned space to avoid getting wet in the rain. Restaurants – There is a variety of restaurants in the town of Aguas Calientes. The most economical place to eat is the Central Market. The cost of a lunch is 8 soles (2.5 $). The restaurants remain open almost all day and provide breakfast, lunch and dinner. The cost of the trip to Machu Picchu depends on the types of services that the visitor wishes to experience. The most important cost is the train trip for foreigners. The most economical way to avoid this expense is through the Hidroeléctrica route. 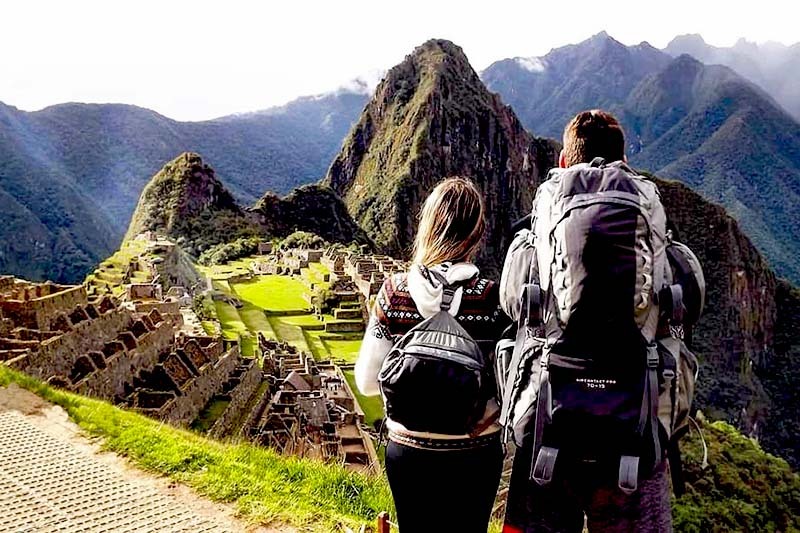 The average cost for a trip to Machu Picchu 2 days and 1 night per person is 295 U $ D. This price includes tickets, travel by train, bus trip, guide service, food for 2 days, hotel and other minor expenses. * The price represents an average cost of a visit to Machu Picchu for 2 days and 1 night at your own expense. The cheapest way to get to Machu Picchu is through the route Hidroelectica. The ascent to the Wonder of the World can be by bus or on foot. If you want to save as much as possible, the great option is to camp in Aguas Calientes and eat at the food market. The average cost for a 2-day and 1-night visit is $ 103. The prices of all the products in Aguas Calientes tend to increase with respect to prices in the city of Cusco. It is recommended to bring water, snacks, repellent, sunscreen and other utensils to visit Machu Picchu. In the Historical Center of Cusco there are tourism agencies that offer the Cusco – Hidroelectrica trip for a lower price than the train trip. Once at the hydroelectric power station, the visitor can choose to walk to Aguas Calientes or travel by train. The most economical option, of course, is to walk. Children under 8 years old do not pay the entrance fee to Machu Picchu.